At first glance, you might mistake this for a ’40s or ’50s American or French coupe, with aerodynamic and flowing lines. In reality, this is an incredibly compact Italian car. 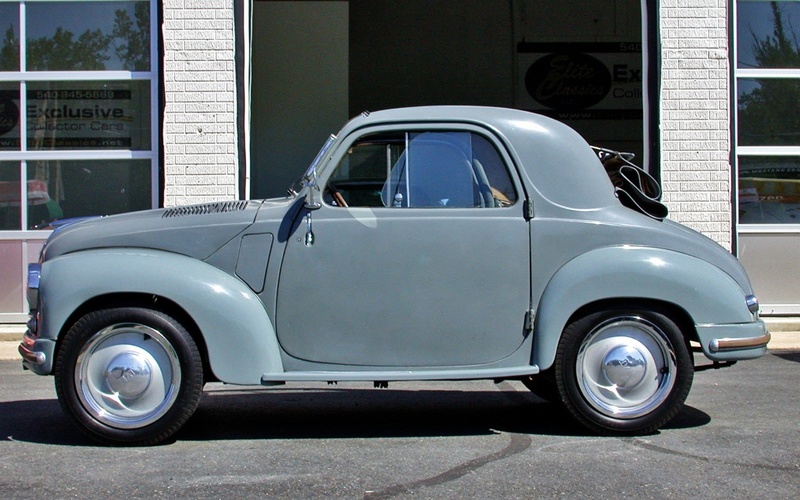 This is a 1951 Fiat 500 Topolino and if you think it looks like someone took one of those big flowing cars and crunched it down, that’s probably because that was Fiat’s goal when they designed it. Fiat wanted a car that could offer the kind of style people had grown accustom to, but was still compact and affordable. 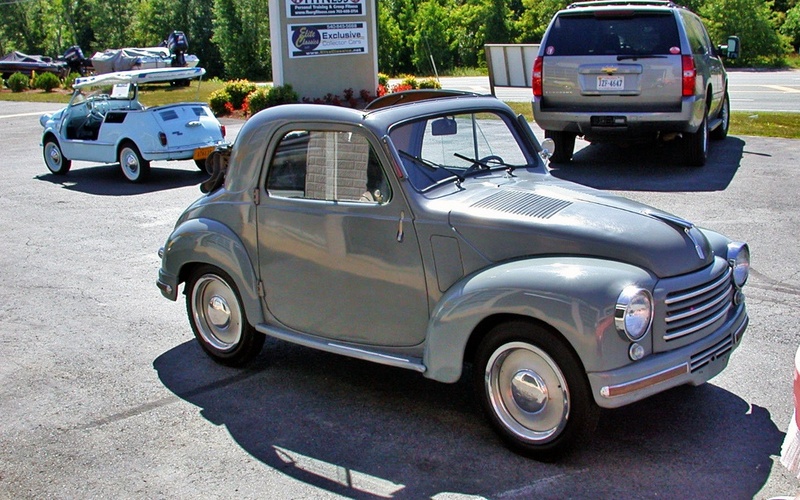 When it came out in 1937, it was one of the most compact cars on the market, yet had the style of a car twice its size. 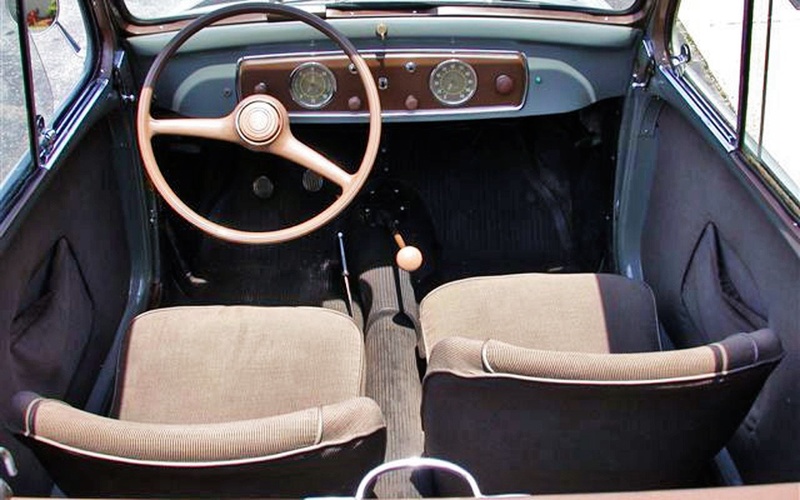 The Topolino was so successful that Fiat built it until 1955, although the design did see a few changes over the years. The one you see above is claimed to be a survivor and can be found here on eBay. Unlike the rear mount 500 that came after it, the Topolino’s motor was mounted in the front with power sent to the rear wheels. 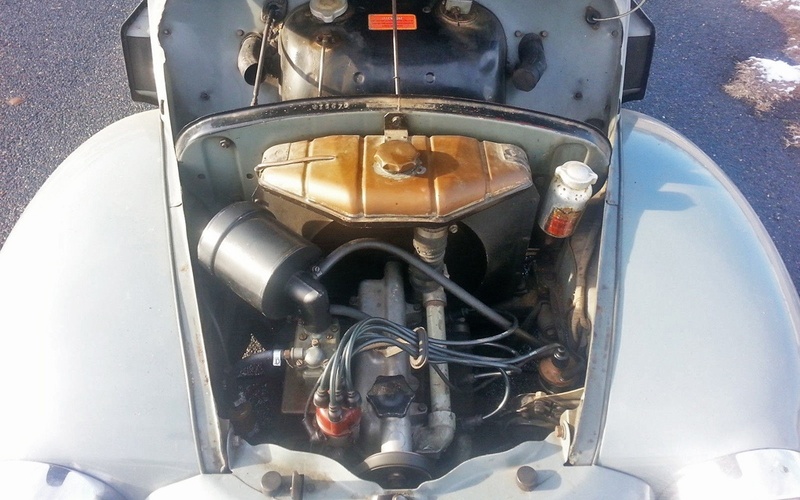 To make the compact design work, the radiator had to be placed behind the 569 cc motor. This small four cylinder motor only put out 16 horsepower, but given the size of the Topolino, it allowed the car to achieve a top speed of about 55 mph. We wouldn’t want to go much faster than that in one, but during the ’60s and ’70 some drag racers saw the potential of the light weight and compact design. It wasn’t uncommon to see a Topolino or two at the drag strip back then, although most had custom chassis with V8s crammed under the hood. While this car was meant to be compact, the interior was actually quite spacious. There are stories in Italy of entire families cramming into a Topolino, which seems unbelievable to us, but there are even claims that Fiat actually redesigned the rear suspension so it could carry the weight of five adults. We assume these claims are in reference to the station wagon version, as we don’t think it would be physically possible to fit more than two into this coupe. Riding in it with just one passenger would make us feel a bit claustrophobic, good thing it has a convertible top! The seller claims the interior is original and looks to be in great shape. Given how simple it is, we don’t doubt this claim. These were designed and built to last, so unless the mileage is extremely high or it was left outdoors, we don’t see any reason it wouldn’t have survived in this condition. There is just something special about the Topolino. Depending on the angle and if there is anything next to it, it’s easy to mistake it for something much larger. We see why so many ended up being turned into either dragsters or clown cars, but we are glad that a few have survived in original condition. Typically these budget minded cars were driven hard and put away wet. This one isn’t perfect, but it looks solid and is ready to be enjoyed. We just hope the seller’s reserve is set considerably lower than their BIN, as we would struggle to pay so much for such a little car. Then again, this might be one of the cheapest cars to have run in the Mille Miglia and could be a cheap and fun way to participate in the prestigious event. Keep it up, great one to share with the masses guys. thanks, but i was looking at the tank on the back side of the fire wall which looks about the correct size for the fuel tank. still can not find a cutaway drawing of car. but did find this which i think show the gas tank in one of the pictures but still not sure if it was a gravity system. and i just found a new fuel pump for B/C moded offer for sale from Mr. Fiat. Just had a look at Dante Giacosa’s book on his time at Fiat. First version of Topolino was gravity-fed fuel. thanks. it makes me wonder how they keep fuel flowing to the carb when going up a steep hill. Dad had one of these in the early 60s in Rome. It was the earlier iteration with the upright grille. I’ve seen pics of those drag cars you mentioned, what a bizarre concept. Nice Jolly. Never seen or heard of one. Cute! If what I see here does this car have “sucide doors”? Looks to me as though the door hinges are at the rear, and the handles at the front. So, “suicide” it is! So very cute. And such a small car, that the wheels appear to be large in diameter, even if they are not. An early version of what has recently become stylish: Big diameter wheels with low profile tires, which fill out the wheel openings. The brass tank is easily identifiable as the top of the radiator. It is the black tank behind and higher, right up against the firewall, which is for the fuel. Gravity feed? Appears to be. What are the tubes at the sides of the tank for, and where do they go? Not into the passenger compartment, I’d hope! I guess this could be called a “survivor”, if the interior is indeed original. But there is no doubt in my mind that it has been repainted. I note that the seal around the trunk/spare tire spot is in dire need of replacement. The spare tire itself has most certainly suffered a funky wear pattern, cupping, as the result of suspension woes. PPI for patched/bondo’d rust required. The coolest thing about this car: The turn signal flaps. I’ve never seen those before, look kind of like the flags used on rural mailboxes to indicate outgoing mail to the courier. I’m grinning as I look at the pictures. What fun. $24K worth of fun though? Not so sure about that. I almost bought a ’39 Topo while in Libya in the ’50’s. Full tattered sunroof & smoky engine, the $900 price drove me away.